What is it that inspires us to write? The pressure of a deadline? Competitive word counting, à la the #GraftonLine project? A serendipitous discovery in the archive? For me, inspiration has taken many forms. Pressure, yes. Guilt, yes. Excitement, yes. But what has done more than just inspire me–what has actually changed the way that I write–is changing things up. When I was a grad student, I felt that I could only write a dissertation chapter after I had accumulated huge files of notes, sifted through them multiple times, and organized my thoughts into long, detailed outlines. I would do all of this sorting for several months; when I finally sat down to write, I did so in my home office with the door closed, from 9:00 a.m. until whenever my brain was done. This was effective in the long run; I finished my dissertation using this writing strategy, and published Trembling Earth a little over two years later. 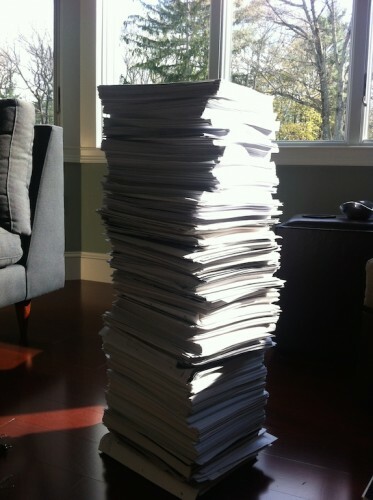 When I began to write Ruin Nation, I was teaching full-time; I still wrote chapter-by-chapter, after many months of note accumulation and organization, but I did not lock myself away for weeks at a time. I wrote whenever I could. And then, Brian Craig Miller, the book review editor of Civil War History, asked me to review the first season of the AMC television show Hell on Wheels for the journal. There was no way I could write this like a traditional book review; the structure, characters, and narrative arc of the show demanded a different kind of approach, a new kind of critical voice. And so I left my office and settled in on a barstool at the island in my kitchen. And when I opened the word document, instead of choosing Garamond—the elegant and compact font in which I had written all of my academic work before this point—I trolled through the options and chose Avenir Book, a clean, rounded, more modern font that has a jovial look about it. In this new space, writing about popular culture in a completely different font, I finished that review in a matter of hours. This experience is what really changed my writing practice, enabling me to abandon obsessive editing and over-thinking, and to find my voice. It has also helped me to advise students: my own, who were writing senior theses, and the graduate students of my colleagues. All of them were seeking advice about how to manage long-term writing projects, and how to work past writers’ block and fear. And so I have told them: do not be afraid to jettison old habits. Write someplace new, and before you are ready. Experiment with different genres. And change your font. I teach, write and talk about the impact of environmental “primes” on our productivity, happiness and success and Samantha told me I’d love your blog post on font changes. I do! Brilliant! Megan – Was just reading Al Mackey’s blog post about Shelby Foote and I was reminded that Foote wrote his narrative he used a dip pen and ink well. You ever tried that? Just think of the font possibilities. Environment is important for me. If it’s messy, I can’t think or be creative. Sometimes, my cleaning and organizing can appear to be procrastination, but some things are a must for me. Perfect = windows open, natural light, the sound of birds, laptop on kitchen table with my cushy office chair. I also find that I write better if I am well rested and I worked out beforehand (perhaps, “Riding on Bikes with Historians..ha). So, it’s an overall declutter (mind/body balance) theme. I’m also more effective in the morning to early afternoon. I’m having great difficulty writing during the school year, but I am contemplating a new approach for 2014-15….just write, even if for a half hour. Sometimes, I dictate and transcribe later. I have found that to have my voice, I must use it (literally). Just write! Whenever you’re feeling energized, wherever you can. The kitchen island is a writing oasis, when my boys are out of the house. I change locations frequently to maintain momentum. I also change musical genres that I listen to while writing (usually start with classical then move to jazz or something instrumental but upbeat when energy dips low), but I don’t change fonts. I don’t even notice my fonts. Dude. You MUST notice your fonts! Ok, I’ll pay more attention. Do you listen to music when you write? If so, do you have a playlist you can share? Historista could be on Spotify. Sometimes I listen to music (my iTunes library (mostly alternative rock), on shuffle. Otherwise, I switch on Coffitivity (http://coffitivity.com/), which provides excellent white noise. Although it does make me hungry for baked goods. What about you? Do you have a playlist to share? You think he would notice, especially since he writes everything in Comic Sans. Oh, and thank you for the suggestion, Megan. I’m breaking up with Hoefler text and taking up with Avenir. I wrote my undergraduate honors thesis via dictation to my sister in her dorm room located above the cafeteria. I wrote my MA thesis on the floor of my apartment, surrounded by photocopies of my documents using Times on my Mac laptop, and my dissertation I wrote on my futon watching old reruns of Fame and Star Trek from 11pm-5am for 6 months straight. I have written in longhand, on my ipad, on my MacBook, on stef’s laptop, in my head, on my phone. But always in moments now, between bites, plot twists on TV, tweets, texts, on-line shopping for fabulous shoes. Aliza! Dictation!?!?!?! That’s wild. I would also love to know what you have written on your phone. And do you still use Times? Or something else? Dictation! I have the best little sister in the world. She would type and cry at the same time as I wrote my father’s story, imagined, aloud, in the space of the dorm room between us. And I use Arial. Calibri. Herculaneum when I want to be really heavy and ancient. My only frustration is how the font can get lost in translation, reinterpreted as it gets transferred from machine to machine. I chose it for a reason, goddamnit. Love it. Also love that you are already fonty (an adjective recently coined by my friend Brian). And I agree–Avenir is purely for my own enjoyment, as when I print it out it looks like Georgia. Which is Not. Right. Isn’t there a Moleskine case for iPads and the like? You should get one! I come at this from a slightly different angle: I am a writer (and historian) who teaches history to high school students. This year, especially, I have been thinking about how moving them away from electronic devices might change their thinking and writing. I wrote a piece about it on my teaching and history blog, cliospalimpsest.wordpress.com. You might find it interesting. When I am really having trouble writing, I use the Jane Austen font. It is nearly illegible, but quite inspiring! Eliza, I love your post about essay exams. I have had similar experiences on the collegiate level. Students write much more tightly focused, cogent essays during in-class exams than they do in take-home exams or essays. As for the reasons why–I think you’ve nailed it. A friend of mine–Jim Downs–also recommends writing without notes; he makes a similar point that this allows you to be “in the moment” as a writer, and more attuned to argument and structure. Thanks for sharing your post! How validating! These same notions have become more and more the norm for me as I drifted out of my Civil War era studies program, finished art school, and then started working in New York. With each shift, there was less time to write, and so my word processor changed. Two years ago, I sat on a library’s quiet zone, taking notes on paper to transcribe later. This year at the Civil War Institute, I was using Evernote on my partner’s iPad to type a source-less draft on a tour bus. Bus writing is always better! I have written some of my best pieces while on the move! You should apply for one of those Amtrak writing residencies. I like this post! changing up the space is important. I wrote my last book in coffee houses, but I’m not feeling the coffee house this time around. I’m plopped down in a chair in the corner of my living room where I can get natural light. It also makes me happy to have my dog, Phoebe, nearby. Her long sighs remind me that it’s time to get up and walk around now and then. I really like your idea of trying on a new font. I’m also trying on a new writing style with this book and I’m enjoying it very much. Again, congrats on your blog. I love light-filled corners! They are like your own little writing nooks. What font do you usually use? I’ve recently started to write in my kitchen … standing at the kitchen counter! It’s been a terrific way to lessen back pain (duh: sitting will get us all in the end, so say the articles of late) and be with my brain in a new place. With tasty snacks on hand. There’s something delightful about writing in the kitchen! Access to snacks, for sure. But also a sense that you’re co-opting a space used for other purposes. And standing! It lets me move around as I write and think. It’s been fantastic.